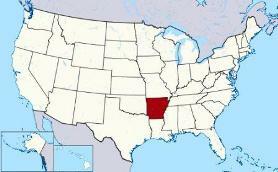 Where is the Capital of Arkansas? 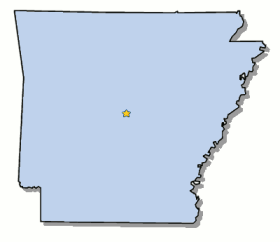 The Map of Arkansas (AR) shows the location of the state capital in the "Natural State". Arkansas has 75 counties, and the capital of the State is Little Rock. On a map, the capital city is always indicated by a star. Interesting fun facts about Little Rock including its history, location, county, current population, size of the city and the nickname of Little Rock, Arkansas. The Map of Arkansas and map provides an outline of the state, which covers 53,182 square miles. The size of the state's capital city, Little Rock, is 116.2 square miles. Test your recognition skills of the map of the state, and knowledge of its capital, with our State Maps Quiz Game. Where is Little Rock located? The location of Little Rock is the meeting of the Sacramento River and the American River in the north of the Central Valley. The city is located in Pulaski County. Each of the 50 states have their own capital city. The city of Little Rock is the capital of the state. The capital does not have to be the largest city in the state, but is usually centrally located either geographically or by population. Fact 3: The population of the capital city - 196,537. Little Rock Nickname "Dogtown" and "Stuttgart"
Fact 7: History - The original "little rock" was dynamited and used as a foundation for a railroad bridge. Fact 8: History - The famous aviator, Charles Lindbergh, made a stop in Little Rock in 1927, four months after he crossed the Atlantic Ocean in the "Spirit of St. Louis". Fact 9: History - Little Rock became the capital of the Arkansas Territory in 1819 and of the state of Arkansas in 1836. Fact 10: History - Little Rock's Old State House was built of handmade brick in 1836. The Old State House served as the state capitol for 75 years and is now a history museum. The number of people, or the population of the capital city of Little Rock, obviously changes constantly but the government statistics for the 2012 population of Little Rock was 196,537, which provides a good indication of the number of inhabitants of the city. We hope that the interesting facts and information about Little Rock will help kids and school children with their homework. Learn more by playing the States and Capitals Game.